The Greenasium really wants to be green. To do it, the new gym in San Diego is turning its customers into real gym rats. The Greenasium , which opened Wednesday, has three specialty spin bikes that push electricity back into the grid, helping provide power to the gym and other electricity customers. 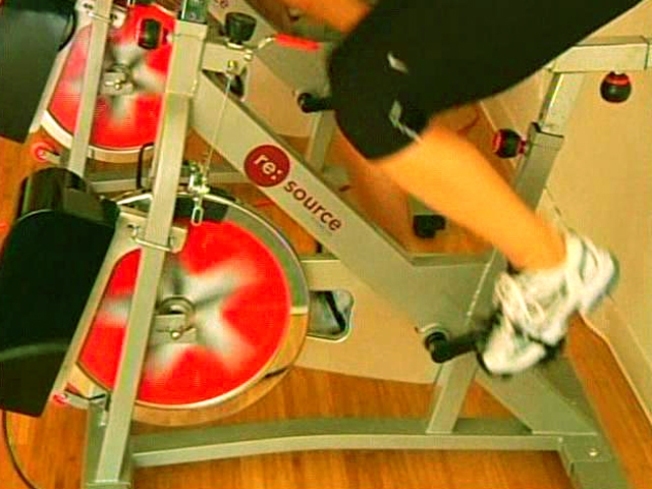 Its the first human-powered fitness studio in San Diego, according to its owners. "The bike's are retrofitted by a company up in Seattle that we work with called Resource Fitness," said Greenasium's co-owner Byron Spratt. "As the bike (spins), the wheel creates DC power, converts it to AC power, which is plugged back into the wall, which puts energy back into the grid." Spratt expects to add elliptical bikes in October to help offset their carbon footprint to an even greater extent. The 2,600-square-foot gym isn't completely human powered, at least not yet, Spratt said. Their goal is to be balanced, producing enough energy to offset what they consume. Every three months, management will look at the gym's power-consumption totals, and then the gym will sponsor activities such as a beach cleanup to offset any additional carbon footprint. The gym's green in other ways, too. Its rubber flooring is made of recycled tires, and the equipment has been refurbished to a near-new state. Other environmentally friendly elements include low-flow showers, dual flush toilets, filtered tap water and a no- to low-plastics policy -- there's no bottled water at the Greenasium.